You were on your daily run, when suddenly one of your knees felt strained. It hurt so badly that you had to stop to stretch out your leg. That didn’t help, so you turned around and limped home. After adding more weight to your lifting routine, you’ve been feeling like your kneecaps are grinding into themselves. Now you feel like you can’t work out at all. What’s going on? Have either of these scenarios ever happened to you? If you can relate, or if you’ve ever experienced any type of knee pain brought on by your fitness routine, perhaps it’s time to consider using compression knee sleeves. What are compression knee sleeves? Knee sleeves are used to reduce pain by providing some support to the knees. They are usually made of neoprene, and are designed to slide up over your knees. You can wear them on one or both of your knees. When you do so, you’ll often feel less swelling and pain both during and after exercise. To anyone who’s suffering from exercise-induced knee pain, this sounds wonderful, doesn’t it? Just how do compression knee sleeves work? Because they compress your knees, knee sleeves help to increase blood flow in the blood vessels located around your knees. This enables you to recover from swelling, strain, pressure and injury much faster. And this is why die-hard runners and weightlifters alike will often tell you that they rely on compression knee sleeves to enable them to workout as much as they do. Want to know some of the great benefits of wearing compression knee sleeves? They help to restrict patella (kneecap) movement. This can prevent pain and even dislocation. Compression knee sleeves increase proprioception, which is your body’s sense of the position and motion of your joints. Proprioception results in good balance and the ability to move easily… which in turn usually leads to fewer injuries. Compression knee sleeves can provide warmth, which promotes better blood flow and reduces strain on the knees during exercise. Are compression knee sleeves for you? Over 4 million Americans over the age of 50 have artificial knees. If that statistic shocks you, think about all of the people you know who work out on a daily basis. Whether you’re an avid runner, hiker, power walker, or you lift weights, compression knee sleeves will support you and help to protect you from future injuries. 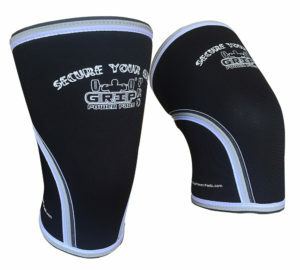 Grip Power Pads compression knee sleeves, for example, are considered the strongest knee sleeves on the market today. They’re 7 millimeters thick, and crafted with ultra-stiff neoprene for optimal compression and unparalleled durability. They also fit further past your knee than other compression knee sleeves. This means that they offer extra support you won’t get from other products. The best part: They were designed by a doctor of physical therapy who specializes in orthopedics. If you’re an athlete or just someone who wants better joint health, consider getting a pair of compression knee sleeves. Your knees will thank you!